Happy Women’s Day everyone! I don’t think this is a day where women should be spoilt so I am not wishing that for you. Instead, I hope you all enjoy the relaxing day off and spend it with loved ones. I know I am! I then tore off a little piece of my makeup sponge and using Sinful Colors – Snow me White and Sinful Colors – Dream on I sponged it on over the Rise & Shine. I didn’t really have any particular method or look in mind. In hindsight, I think I might’ve been a bit eager with the white because it did cover up a little too much of the green. I did notice that if I had more polish on the sponge I got bigger ‘blobs’ on my nail – as per my middle finger – but if I dabbed off some on a piece of paper, I got more of a marbled affect – as per my ring finger. Of course, I had to add some stamping. 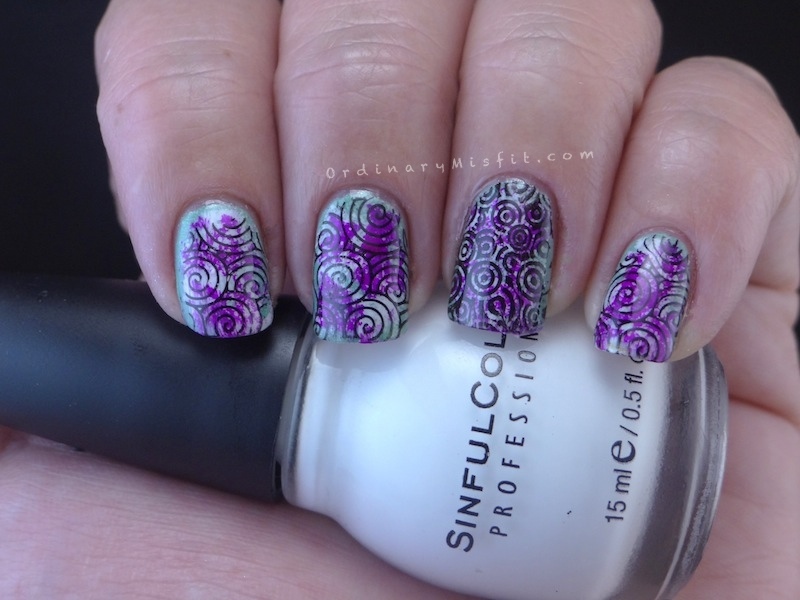 So using Pueen19 for my ring finger and Pueen13 for all the others, I stamped circles. All of these are 2 coats with no topcoat. Both Rise & Shine and Dream On dry matte. As you can see Dream On still has some visible nail line (VNL) but with a thin third coat it is perfect. Dream On is actually from a neon collection so if you add white undies to it it really pops. What do you think of the abstract look? Do you prefer it before or with the stamping? Let me know what you think. Have a great day and enjoy the long weekend! Seriously gorgeous design as always. Happy womansday and hope you have a fun day. Thanks so much Lynette! Happy Women’s Day to you as well. Hope you’re having a great day! All of these are so beautiful. 🙂 I’d love to see all your polishes! Thanks. So do I. I think white stamping would’ve been nice though. I think I like it better without the stamping because it almost looks like a painting on your nails and the stamp covers that a bit. I agree with you. Even though I like the stamp design I think it just looks a bit ‘messy’ with the stamp where it still looks a bit abstract without it. I am sorry now I didn’t stamp in white because that might’ve made a difference.